The Nashville Predators are one of 16 teams to have reached the season’s midway point with at least 41 games played. The Predators have played exactly 41 games and have a 24-15-2 record with 50 points and are second in the Central Division, two points back of the Winnipeg Jets. Because it’s the team’s halfway point, I felt it’d be an appropriate time to hand out awards for the first half of the 2018-19 season. 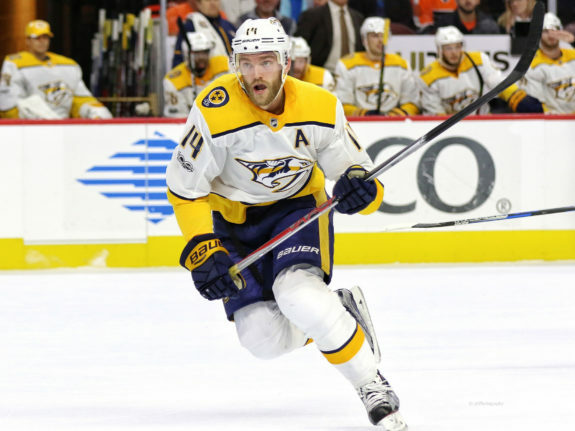 Similar to the NHL’s Hart Trophy, which is awarded to the “player judged to be the most valuable to his team,” the Wayne Gretzky Award is presented to the Predators’ most valuable player from the first half. I’ve named it after The Great One because he won nine MVPs, enough that the Hart Trophy should be renamed in his honor. Picking the Predators’ MVP of the first half was not easy. They lack a player like Alex Ovechkin, Connor McDavid or Taylor Hall who is considerably more talented and productive than teammates. That’s because the Predators create offense by committee and one player is unlikely to build a sizable scoring lead. And while I’m not a fan of handing an MVP award to the player with the most points, it is fitting in this situation. Johansen, the team’s top center, has appeared in all 41 of the team’s games this season with seven goals and 35 points. He has won 53.8 percent of faceoffs while averaging 19:41 of ice time per game and has 18 penalty minutes. His .85 points-per-game (P/G) rate is his highest since the 2014-15 season and puts him on-pace to surpass the 54 points in 79 games he tallied last season. Plus, keep in mind, he has done this without Viktor Arvidsson and Filip Forsberg on his line for the majority of the season. He has a point in 22 of his 41 games, with multiple points in 10 games, and hasn’t gone more than three games without a point. When he is on the scoresheet, the Predators are 14-7-1 and 10-8-1 when he’s without a point. He plays big minutes for the team, leading their forwards in ice time by nearly a minute per game, and is tasked with playing in all situations with 1:22 of shorthanded time per game. He may not be as offensively-minded as others on the team, but he is rarely injured, shows up when needed and the team generally follows his lead. This award is presented to the player who impacts the team offensively on a consistent basis and is a threat to net a goal or make an accurate pass at any time. I named this award after Patrik Laine, the Jets’ lethal scorer, to emphasize the point that it’s about offensive play, not being a two-way forward or being strong on the backcheck, although the winner is pretty good in his own zone. I mentioned this when introducing the award, but let me clarify again that I am not suggesting that Arvidsson doesn’t play defense or isn’t a strong two-way forward. Far from it. However, he has been the Predators’ best player this season from an offensive standpoint. In fact, it’s a shame he hasn’t stayed healthy this season as he’d be on-pace to score 53 goals in an 82-game season, an unsustainable, yet still impressive, average. Even with him missing 24 games across two stints on injured reserve, he is still on-pace to net 37 goals for the season, a total that would still set a career-high. Arvidsson has appeared in 17 games this season and has 11 goals and 17 points with one power-play goal. He is averaging 18:55 per game, a minute more than his previous personal-best, has a positive turnover margin and 10 penalty minutes. He has six games without a point, five with two or more points and has yet to go more than two games without being on the scoresheet. The Predators have thrived when Arvidsson registers a point with a 9-2-0 record, but have gone 3-3-0 when he hasn’t. 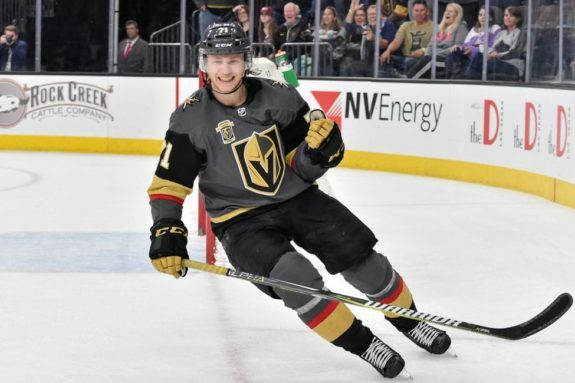 His strong campaign is a continuation of recent trends with his points-per-game average increasing each season in the league and he’s currently doubling his career-high in goals-per-60 at five-on-five. Although there’s reason to expect some regression given that he’s shooting 21.6 percent, he is still having a remarkable season filled with timely production, including his power-play goal against the Washington Capitals on Dec. 31 to put the game out of reach. That goal made the score 6-3, ensured that the team’s six-game losing streak ended and capped off a great mom’s trip. An award that, in my opinion, the NHL is missing is for the league’s best defensive defenseman. The Norris Trophy is great, but it tends to be given to a blueliner with a high point total and lofty plus/minus. That player is valuable, especially in today’s league, but the trophy overlooks the player who does his job well and shuts down the opposition. Rod Langway was great at both. Defensemen aren’t the only players eligible for my Rod Langway Award, but rather any player who excels in the defensive aspects of the game. While Ellis is a productive blueliner with four goals and 18 points in 41 games, his defensive play has jumped off the page this season. He’s averaging 24:53 per game, his first time over the 24-minute mark, and is the only Predators defenseman with a positive turnover margin at plus-six. If that continues, it will be his second season with a positive margin. It also helps that he’s appeared in every game this season and is on-pace to play in 82 games for the first time in his career. Although Ellis has offensive skills, his goals-per-game rate is his lowest since 2013-14 and his points-per-game rate is his lowest since 2015-16. Additionally, his shots-per-game and shooting percentages are down relative to career norms, yet that hasn’t negated his impact. He is averaging 2:42 of shorthanded time per game and is required to be defensively responsible given that Josi, a blueliner who regularly acts as a fourth forward, is his partner. This means that Ellis is often the lone Predator back on two-on-one chances, a fact that negatively affects his metrics, but showcases his one-on-one skills. He is a great shot blocker even if he leaves his skates too often, in my opinion, and uses his stick well to break up passes, especially in the low slot. Something I’ve noticed more this season is his improvement on recoveries. He is typically good positionally, but when an opponent gains position on him, Ellis recovers to drive the player to the outside. To be honest, I haven’t always been a fan of Ellis’ play as I was caught up in what Josi does with the puck and overlooked Ellis’ quiet play. However, I now appreciate the element he brings and it’s why he deserves the mid-season Rod Langway Award. This award goes to the player who has shown the most improvement. In this case, it’s given to the player who has improved the most since last season concluded. I named this award after William Karlsson due to the breakout campaign he had in 2017-18 as the top center of the Vegas Golden Knights after he had been relegated to a bottom-six role with the Columbus Blue Jackets earlier in his career. Choosing Ekholm for this award may seem like a curious decision. How does a player improve on being a top-pair defenseman? By still thriving when paired with Dan Hamhuis. The Ekholm/Hamhuis pair was established due to an injury to P.K. Subban, Ekholm’s normal partner. In 310 five-on-five minutes, the Ekholm/Hamhuis pair has strong metrics. However, remove Ekholm and Hamhuis’ individual metrics are abysmal, so the fact that the pair stayed afloat is due to Ekholm. 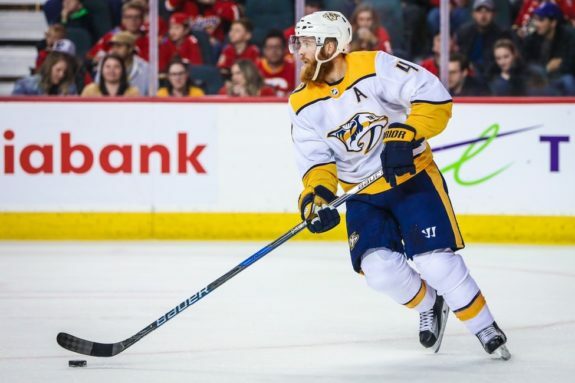 Furthermore, despite playing with an anchor like Hamhuis, Ekholm is experiencing career highs in assists-per-game and points-per-game as well as five-on-five points-per-60 and shots-per-60. In 40 games this season, he has three goals and 25 points while averaging 22:59 per game. This includes 2:10 per game on the penalty kill and starting in the defensive zone 32.9 percent of the time at five-on-five, highest among Predators defensemen. The award for biggest surprise is given to the Predator who has seemingly come out of nowhere and been successful. I’ve named it after Martin St. Louis, the Hall-of-Famer who went undrafted but scored 1,033 points in his career. And while the first-half winner of the award isn’t as talented as St. Louis, he did come out of nowhere to be a productive player this season. 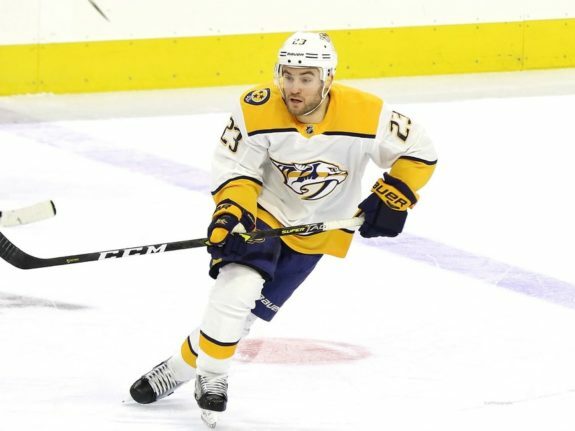 The Predators signed Grimaldi to a one-year, $650,000 contract in the offseason mostly to play in the AHL and to fill in as necessary at the NHL level. That expectation was how the season began as he had 11 points in 10 AHL games. But then injuries hit the Predators and he was called up to provide relief. He’s appeared in 22 NHL games this season with three goals and five points and has tied or set career highs in all three areas. 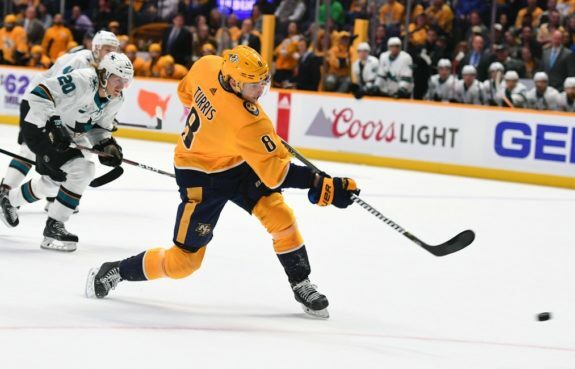 He is averaging 9:31 per game and head coach Peter Laviolette has used him in an offensive role, starting him in the offensive zone 40.1 percent of the time at five-on-five. Grimaldi is tenacious on the forecheck and displays speed and strong hands, which he put on display when he redirected a Zac Rinaldo pass into the Capitals’ net on Dec. 31. Considering Grimaldi was drafted in the second round of the 2011 Entry Draft, perhaps it shouldn’t be surprising that he is producing in the NHL. Prior to turning pro, he played for the U.S. National Team Development Program and the University of North Dakota, two elite programs, represented the United States internationally and has excelled in the AHL. Yet he has never received much of a chance in the NHL. Perhaps this time he sticks as he should earn a spot on the Predators even after injured players return. The award for biggest disappointment is pretty straightforward. There are expectations placed on a player that he does not live up to. This award could have been named after many players. I went with Nail Yakupov, the first overall selection in a loaded 2012 Entry Draft. Those taken after him include Morgan Rielly, Hampus Lindholm, Jacob Trouba and Filip Forsberg. Yakupov, who looked promising ahead of the draft, was a bust for the Edmonton Oilers and he’s now in the KHL. Turris, my selection as the Predators’ biggest disappointment isn’t on the level of Yakupov, but he’s still been a letdown. In 30 games this season, Turris has six goals, including three on the man advantage, and 18 points while averaging 15:52 per game and winning 50.9 percent of faceoffs. He also has a plus-one turnover margin and starts in the offensive zone 50.1 percent of the time at five-on-five. Turris’ scoring rates are regressing for the second straight season with both his points-per-game and goals-per-game rates continuing to decrease and his shots-per-game rate at a career low. Meanwhile, his shooting percentage is above his career average. 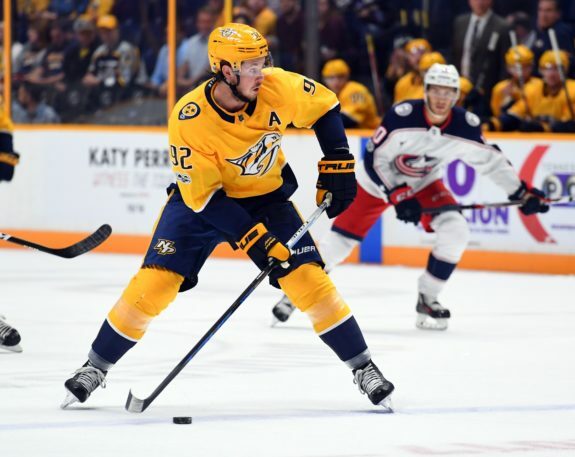 He doesn’t kill penalties and was supposed to give the Predators great center depth, but has underperformed in his one-plus season with the club. Not to mention, with a $6 million cap hit, he hasn’t lived up to his contract either. Could his regression be injury-related? Perhaps, but that doesn’t explain last season’s decline. For now, he remains the team’s most disappointing player. Juuse Saros and Pekka Rinne have each had highlight reel saves in the first half of the season. The save below gets the nod because, one, it’s a glove save that has a high degree of difficulty, two, it looked incredible, and three, the save occurred at an important moment in the game. 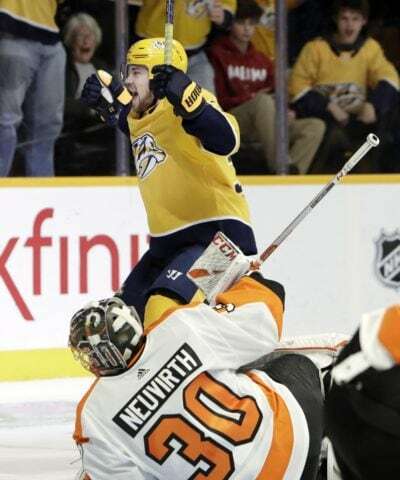 The save took place in a Nov. 27 game against the Colorado Avalanche with the Predators down 3-2 in the third period. Matt Nieto of the Avalanche put a shot on net that Rinne saved but the ensuing rebound landed on Matt Calvert’s stick. Rinne stopped the resulting backhand attempt with a diving stop that kept the game in reach. The best goal of the first half occurred in the second game of the season in a road matchup against the New York Islanders. Less than four minutes into the game, and with the score tied at zero, Arvidsson received a pass in the neutral zone. As he entered the offensive zone, the Islanders had men back, presenting Arvidsson with a one-on-two chance. The Islanders’ defenseman did well to drive him to the outside. However, Arvidsson deked through his own legs and went around the defender, which gave him a clear path to the net. He then stick-handled in tight near the goaltender and pushed the puck past Thomas Greiss’ leg pad. How do you feel about my choices for the team’s awards from the first half of the season? Let me know in the comments below. Also, I would like to write a mailbag article that answers Predators-themed questions from readers. If you have any questions you’d like answered, please ask them in the comments section or send them to me at @Gipe92 on Twitter. Thanks for reading.